The Arcata City Council finally approved the biggest infill housing project in the city’s history, but not before capping the number of beds at a much lower number than originally proposed. Word on the street is that the developer is going ahead with the project regardless of the restrictions. The City of Arcata got rid of parking requirements for downtown development years ago. The City of Eureka’s new proposed zoning code will dramatically reduce its requirements. 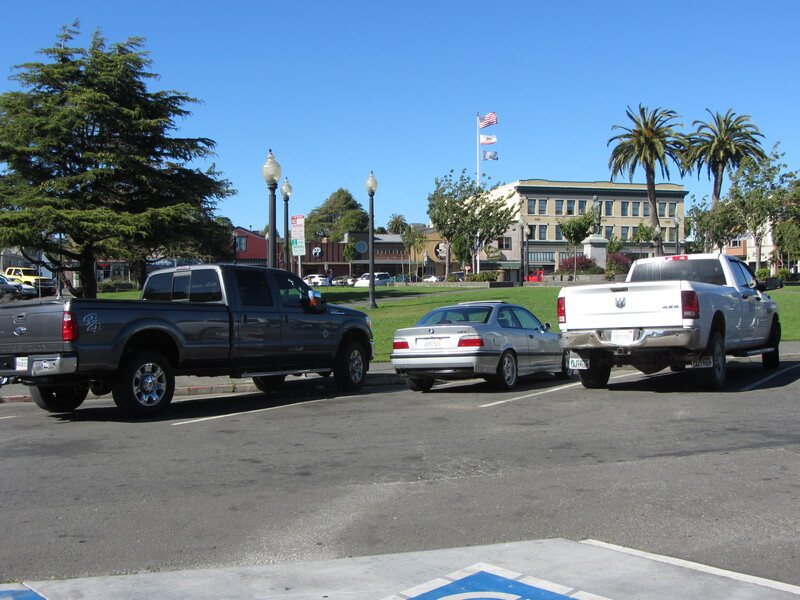 And last night, the Humboldt County Planning Commission – at the urging of CRTP – recommended a change to the zoning code that would allow local community plans to reduce parking requirements in town center areas like McKinleyville’s. Pedestrian-oriented streetscapes may finally be within reach! Both the Arcata Plaza Improvement Task Force and its Transportation Safety Committee talked a lot about the Plaza at meetings this week. CRTP continues to advocate for partial pedestrianization, and the North Coast Growers Association is proposing partial street closures on 8th & 9th Streets for their farmers markets this season. Meanwhile, a few worried business owners are mobilizing to oppose any reduction in car driving or parking. The last the public had a good look at this project was 5 years ago. Now, they’re scheduled to ask the Coastal Commission for approval in San Diego in June, and they’re holding this local meeting next Tuesday (at the Commission’s request) to get more local input. The City of Arcata will be hosting another workshop on plans for its portion of the proposed Annie & Mary Trail on Tuesday, April 23, at 5:30pm at the Hampton Inn in Valley West. Before that, on Monday from noon to 6pm, there will be a pop-up demonstration of trail design ideas near the skate park on Sunset Ave.
Take the Local Mobility-on-Demand Survey! And come to workshops on May 1 & 2 to have your voice heard. Funding maintenance and repair of our extensive road network remains a long-term challenge – one that seems increasingly unsolvable. A group ride to a Moose lodge Swedish pancake breakfast is scheduled for this Sunday – a prelude to Bike Month. Bike, scooter and pedestrian advocates team up. San Francisco was one of the first cities to experience a proliferation of e-scooters, and one of the first to experience the backlash. Now, a one-year pilot program to regulate them is being called a success. Cities around the world are watching closely. Just think of the block parties! The Congress for the New Urbanism released the list, which includes I-980 in Oakland and I-5 in Portland. Meanwhile, the online environmental publication Grist takes a deep dive into the history of I-980 and the new attempts to tear it down. The Collector is CRTP’s weekly transportation news roundup, published every Friday. We focus on North Coast news, but we also include relevant state, national and international transportation news – plus other items that we just find kind of interesting! To submit items for consideration, email colin@transportationpriorities.org. At long last, the NCRA has given up its quixotic quest to revive the railroad and avoid environmental scrutiny. Its Board now claims to be gung-ho about a transition to a Great Redwood Trail authority. Meanwhile, committees in the state legislature are moving forward budget amendments that would allocate $3 million to help carry out the transition. Following up on the new General Plan, city staff are proposing a new zoning code with lots of incentives for infill development and a significant shift in focus away from car-centric planning and toward more accommodation of pedestrian, bike and bus modes. The city’s Planning Commission had been scheduled to hold a first hearing on the new code this week, but that hearing has been delayed until April 23rd. The latest iteration of the Arcata infill housing project (we lost count of the number of versions it’s been through a long time ago) seems to come in under Arcata Mayor Brett Watson’s previously stated limit of about 600 beds. Will he and the rest of the Council finally give it their stamp of approval? If built, the project could boost Arcata’s walkability quite a bit. Can We Have Dense Mixed-Use Development in Unincorporated Communities? Last week, the Humboldt County Planning Commission discussed rural and wild land zoning regulation changes. Next week, they’re discussing mixed use zoning in urban and small-town areas. Meanwhile, the County has planned a new round of public workshops on its Housing Element update. Guess what will be a major topic of conversation? Transportation, of course. The event is happening this weekend in Fortuna. Could one of them be you? Full disclosure: CRTP Executive Director Colin Fiske is also the current President of the North Coast Co-op. But he swears he didn’t know anything about this super-cool article until it was published. It’s a tricky subject, given that low-income communities and communities of color are less likely to be served by high-quality public transit – but more likely to ride it. Still, everyone seems to be converging on an agreement that something like congestion pricing is necessary in many cities. The Humboldt County Association of Governments’ Technical Advisory Committee (TAC) met yesterday and took on a slew of important topics. Arguably the most significant item was its review of the proposed annual Unmet Transit Needs report from the Social Services Transportation Advisory Council. The SSTAC found that there are two unmet transit needs which are “reasonable to meet” – meaning under state law they’ll have to be met. The first is an additional bus stop in southwest Eureka; the second is limited Saturday bus service to Blue Lake. This week, the Humboldt County Planning Commission weighed proposed changes to the zoning code text related to timber lands and other rural and wild areas. On April 18th, they are scheduled to take on the proposed new mixed-use zones, which are meant to encourage pedestrian-oriented development in the centers of established communities. The cost of repairing this season’s road damage in Humboldt County is estimated at $20 million. Meanwhile, the Measure Z Citizen’s Advisory Committee has rejected the Public Works Department’s $3.5 million request for road repairs. Among the objections raised is the unclear relation to the proposed new Highway 101 interchange which would serve the project. 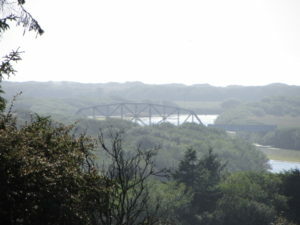 Rain or shine, join us on Saturday for a beautiful ride through the Arcata Bottoms! The free public event in Arcata will feature information about local trail projects and comments from Senator Mike McGuire about the Great Redwood Trail. Some members of the public got to tour a remote stretch of railroad right-of-way in the Eel River Canyon that will someday host part of the Great Redwood Trail. Another chapter in the never-ending Humboldt Bay dredging saga. The disturbing nationwide trend of increasing pedestrian fatalities shows no sign of abating. As we all know, the location and density of housing is one of the most important factors in determining transportation mode share. So there better be some transpo-nerds at this thing! Meanwhile, the County has more workshops planned for its General Plan Housing Element update, too. Better Bus Service in Crescent City? At its meeting next week, the Del Norte Local Transportation Commission will consider a resolution requesting state funds for revived Saturday service and a free bus pass program. Meanwhile, the Humboldt Transit Authority Board heard this week that Tish Non-Village Transit, which has served the Loleta and Fernbridge area for the last three years, will be ending service soon. That’s because it has failed to meet a federal “fare box recovery” requirement, meaning not enough people are buying tickets or passes. HTA plans to adjust its Redwood Transit Service route to cover the area instead. If you ride your bike to the 21st Annual Seed and Plant Exchange on Saturday, we’ll take it at the door and watch it for free. Will cars just become too inconvenient for the average person in the face of easier, cheaper mobility options? Perhaps appropriately, it would be the first US city to implement a charge for driving in the city center. Will San Francisco be next? The Humboldt County Association of Governments also adopted the final state-mandated housing plan for the region this week. As usual, the courtroom was filled with opponents of the Caltrans project. The judge seemed sympathetic to opponents’ arguments, although a ruling has not yet been issued. The County is soliciting public input as it develops a comprehensive Climate Action Plan. Meanwhile, local high school students hit the street this week to demand climate action. We know we don’t need to remind you that transportation is by far the biggest source of local greenhouse gas emissions. Lots of transportation infrastructure is at risk, particularly around Humboldt Bay. A new study shows that a lack of adequate pedestrian infrastructure in and around tribal lands is one of the main reasons there is such a high death rate for Native people who are walking. In most parts of the world, more men than women use bicycles for transportation. How can we change that? A new study finds that self-driving cars are less likely to identify (and thus avoid) pedestrians who have darker skin tones. A fascinating article about how an obscure design guide produced by the National Association of City Transportation Officials (NACTO) helped push protected bike lanes into mainstream transportation planning practice. Meanwhile, the transit agency in San Francisco has voted for a new protected bike lane on one of the city’s major streets. 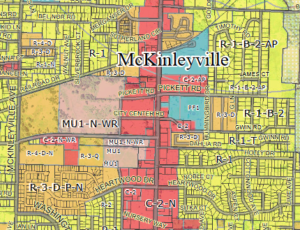 McKinleyville Asks: Which Comes First – the Zoning or the Community Plan? 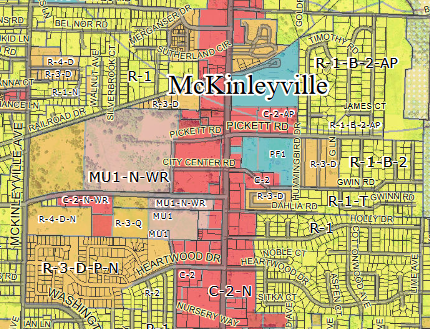 Confusion reigned at a special meeting of the McKinleyville Municipal Advisory Committee this week for the County to gather input on proposed zoning text amendments to implement the new General Plan. Residents complained that they didn’t know how we’d gotten to this point, or how to make sense of the County’s idea to do community planning for the proposed town center this summer – after the zoning rules have already been finalized. Following a suggestion from CRTP’s own Colin Fiske, the Committee eventually voted to ask the County to change the zoning rules to allow future community planning to specify further standards which could supersede existing regulations. CRTP believes that good town center plans in McKinleyville and other local communities hold the key to a more walkable, bikeable, and transit-friendly county. The County Planning Commission is scheduled to take up the zoning text changes next Thursday. The California Transportation Commission approved the request from Caltrans and local elected officials for substantial funding for environmental impact analysis and other preliminary studies. A North Coast Journal reader highlights the fact that this project, if constructed, won’t impact only the Grove – it will mean more large trucks throughout the region. CRTP’s own study of this issue is available here. Inquiring minds from the League of American Bicyclists want to know. The proposal is in line with what science and official state policy say is necessary to cut greenhouse gas reductions within the time required. But trucking companies apparently think it’ll be harder to replace diesel than to deal with catastrophic climate change. Oh, the fun we can have with temporary street closures. This example from San Francisco shows that when officials are motivated, a major street makeover is possible in a short amount of time. Better for the environment than a gas SUV? Definitely. Better for pedestrians? Not so much. 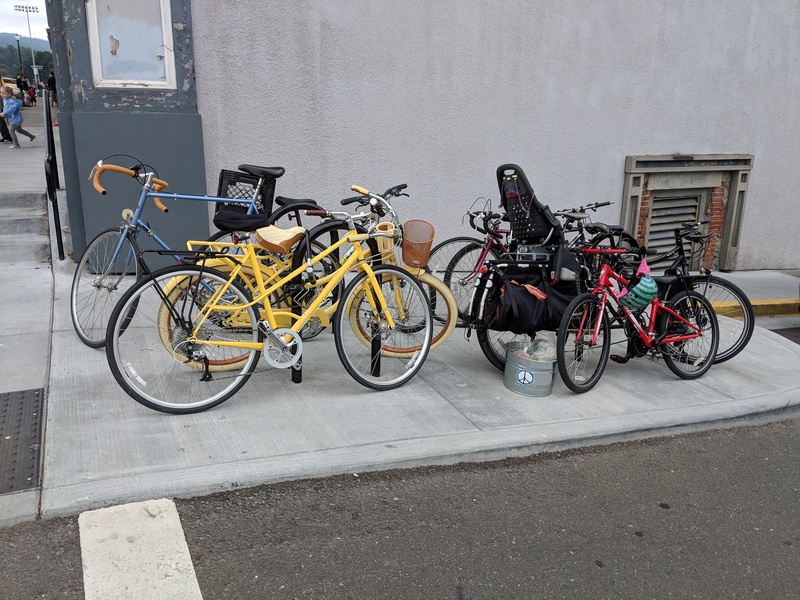 Thankfully there are no dangerous bicycles to be seen in this typical photo of the Arcata Plaza – only cars and pickup trucks. At its umpteenth hearing on the proposed large residential project, the Arcata City Council essentially asked the developer for the same modifications they had already asked for and been told were impossible. CRTP Board Member Keenan Hilton spoke at the hearing in support of The Village as an important infill development which will lend itself to active transportation – although preferably with a reduced parking lot. The next hearing will be on March 18th at the Humboldt County Courthouse. 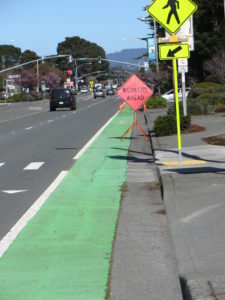 The CTC will consider an ADA upgrade project on Broadway in Eureka, modest pedestrian safety improvements at the south end of McKinleyville’s Central Ave, and a Class I bike path in Manila, along with extra money for the Highway 36 road-widening project near Alton. There are also staff reports on a number of local projects, including emergency storm damage repairs. The biggest request is for road maintenance and repair. Not too surprising in the context of the recent damage resulting from just a few major storms. The Eureka Transportation Safety Commission Will Meet! After many months of limited agendas and canceled meetings, the city has a meeting scheduled next week with new members and new agenda items. The most recent data show pedestrian fatalities up and people driving more. If Caltrans can’t make progress toward decreasing both of these key indicators, our lives and the climate will be at increasing risk. It’s a bus! It’s a train! It’s bus rapid transit! Can urban alleyways be repurposed as more natural social spaces? A jumble of overlapping projects and objectives aim to improve bike and pedestrian facilities, but also move traffic faster. Faster cars are more dangerous to people on bike and on foot, of course, but no irony has been noted in Caltrans’ presentations. Many state highways and local roads were impacted by the week’s weather. 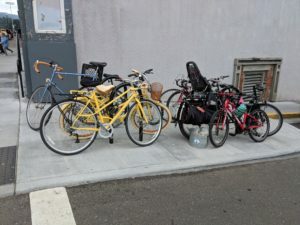 Of particular note for bicyclists, flooding in the Arcata Bottoms blocked a popular bike-commuting route between McKinleyville and Arcata for several days. On the North Coast, our roads have land slides, and our marine corridors have shoaling. On Thursday, the Board of the Redwood Coast Energy Authority directed staff to conduct public outreach and continue researching the goal of providing Humboldt County with 100% clean, renewable energy by 2025 (which had been recommended by the Authority’s Community Advisory Committee). As much of our transportation system looks set to transition to electric power, the sources of that electricity become more and more relevant to transportation advocates. The Del Norte Local Transportation Commission’s regular March meeting was cancelled, as were the regular Technical Advisory Committee meetings for both DNLTC and HCAOG. Can Block-Chain Technology Help Reducing Shipping Emissions? Or at least hold shipping companies more accountable? A new report from the Post Carbon Institute argues that “reruralization” will be necessary for a post-carbon society, in part because of the costs of long-distance transportation of food. But what about the transportation of people, which is much more impactful in rural areas and is already one of the primary factors driving greenhouse gas emissions higher? Next Thursday at 5:30 pm at the Wharfinger building, local Caltrans staff will tell the public about a number of projects currently planned or under way along Highway 101 in Eureka – including a proposal to continue the 4th-5th Street one-way couplet through the Balloon Track to a newly one-way Broadway and Koster couplet. It’s the latest in a long line of Caltrans ideas for moving traffic faster through Eureka. The City Council’s Plaza Improvement Task Force didn’t make a final decision at its meeting last night about which criteria it will use to assess proposed changes to the Plaza. But at CRTP’s suggestion, they did add another potential criterion to the list: considering the comfort and safety of the Plaza’s most vulnerable users, including people on foot, bicycle, and assisted mobility device. Among the items in the plan for the Humboldt County Association of Governments are funding for development of local transit ridership projection software and an online bike map app. 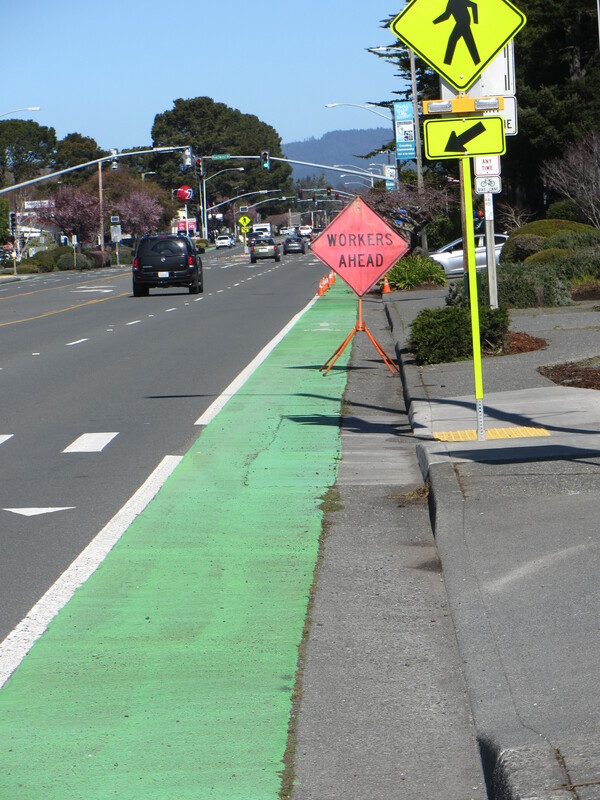 A sign warning motorists about the presence of workers in the right-of-way blocks the bike lane and sends bicyclists into the car lanes. No workers were actually present at the time this picture was taken. 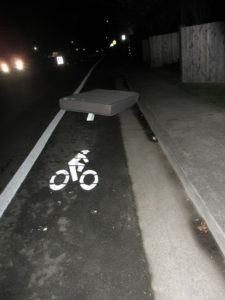 Send your pictures of bike lane or sidewalk obstructions to colin@transportationpriorities.org. The state’s decades-old right to set stricter vehicle mileage standards than the federal government is under threat by the administration, which is trying to roll back federal standards as well. Transportation is already the nation’s largest source of greenhouse gas emissions, and growing. The global climate could hang in the balance. There’s almost no mention of transportation and land use. A new type of company aims to be a sort of hybrid between traditional transit and modern app-based ride-hailing services. The jury’s still out on the long term impacts. What Will It Take for Eureka to Cut Carbon Emissions? The State Senator wants to conduct public outreach along the route of the proposed trail to receive local input on what the trail should look like in each community. Of course, transportation accounts for the bulk of local greenhouse gas emissions, so hopefully mode shift will be front and center in their planning. Caltrans is teaming up with local elected officials to request the money for preparation of an Environmental Impact Report. The estimated cost of just studying the impacts is an indication of just how big this project will actually be. At least if you hit this and flipped over your handlebars, you’d land on something soft. 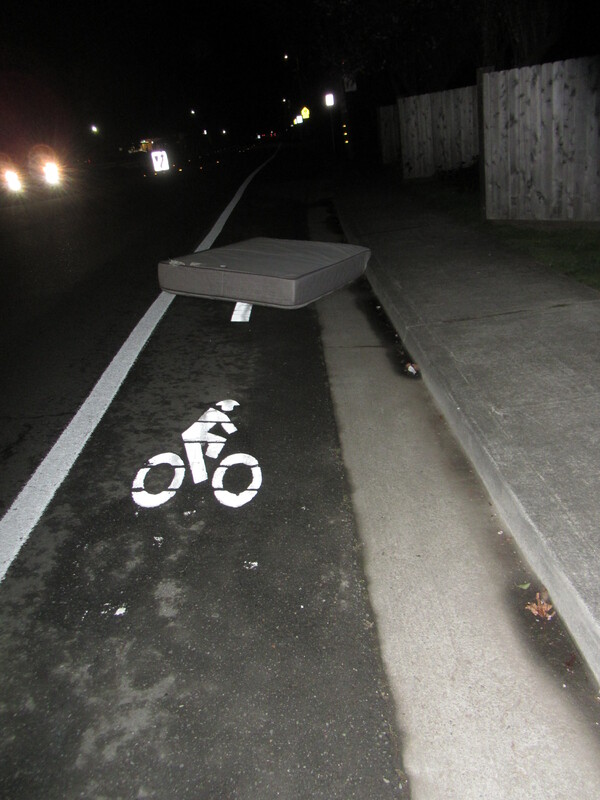 Send your pictures of bike lane or sidewalk obstructions to colin@transportationpriorities.org. What Exactly Did Newsome Say About High-Speed Rail? While many news outlets reported that the new governor is planning to limit the long-awaited rail line to just the Central Valley, StreetsBlog points out that what he actually said is that he’d prioritize finishing that portion while still pursuing funding for the rest of it. Spurred by state regulations, investment in electric trucks, buses and passenger vehicles is growing fast.